As Moorefield GAA Club continue to build out its underage hurling structures which should see it enter a Minor hurling team for the first time in many years, into the 2018 Kildare hurling season, we are reaching out to the Newbridge community to ask for your assistance. In order to further build on the great work that has been completed to date, we are hosting a Club Hurling Development Workshop that will provide a platform for discussion for people who have an interest in promoting the game of hurling within our great club. 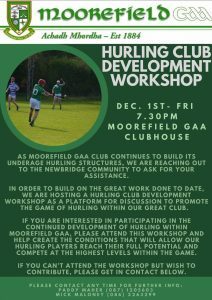 If you are interested in participating in the continued development of Hurling within Moorefield GAA, PLEASE ATTEND THIS WORKSHOP and help create the conditions that we allow our hurling players reach their full potential and compete at the highest levels within the game. The workshop will take place in Moorefield GAA clubhouse at 7.30pm on Friday the 1st December. If you can’t attend the workshop but you want to help or contribute, please contact Paddy Maher 087 1205603 or Mick Maloney 086 2263299 at any time.